Identification. The official name of the country is the République Centrafricaine (CAR). Previously it had been Oubangui-Chari, one of the four territories of French Equatorial Africa, bound by the Ubangi River to the south and the Shari to the north. Before independence, there was no sense of a common culture among the indigenous peoples, who thought of themselves as members of lineages and clans, and as villagers. After colonization, when members of different ethnolinguistic groups came into contact, there developed a sense of being riverine (Sango, Gbanzili, and Ngbaka on the Ubangi River), forest (Mbati and Isungu) or grassland peoples (Gbaya and Banda). There is also the hunting, gathering and patron-dependent culture of the Babinga (pygmies) in the forests of the southwest. Location and Geography. The country lies at the center of Africa in a region where wooded grasslands adjoin dense rain forests and has an area of about 239,400 square miles (620,000 square kilometers). The capital, Bangui, originated at the site of a French military post established on the banks of the Ubangi River in June 1889. Demography. The population in 1988 was 2,688,426, of whom 43 percent was less than fifteen years old. Bangui's population has increased because of forced labor in the hinterlands in the colonial period and, since independence, urban attractions and economic opportunities. There are fifteen secondary urban centers of populations with from twenty to thirty thousand inhabitants that consist of villages inhabited by persons with different employment and ethnic identities. The vast majority of residents speak languages belonging to the Ubangian family, the most important of which are Banda and Gbaya, some of whose dialects are mutually unintelligible; Nilo-Saharan languages are spoken near the Chad border, and Bantu languages near the Congo (Brazzaville). Although Muslims have been in the territory since it was first colonized, their numbers have increased in the last two decades. In 1992, there were estimated to be forty thousand Mbororo, or nomadic Fulfulde pastoralists. Although it is forbidden to use ethnic names in governmental documents, the average person is very much aware of the mara ("ethnic group") of others, and ethnicity figures highly in daily life and politics. Tribes in the technical sense never existed in this region, although in the east there were two indigenous non-Muslim sultanates. Linguistic Affiliation. After colonization, the conquered people began to communicate in Sango, the pidgin that emerged quickly out of contacts between the diverse foreign Africans who were brought by the French—and the Belgians who preceded them in 1887— to be used as militia, workers and personal servants, and the inhabitants of the upper Ubangi River. By 1910, Sango had become a stable lingua franca spread by soldiers and others serving the whites. Never used by the French in a serious manner, the language was adopted in the early 1920s by Protestant missionaries and later by Roman Catholics as a religious language. Written material in Sango was first published by Protestants. Since independence, competence in spoken Sango has become almost universal except among the Mbororo. In Bangui, Sango is the most frequently used language even in households where an ethnic language is traditional. In 1996, Sango was declared co-official with French. It remains primarily a spoken language in government and education, while French is used in written communications. of denigration by the French, ubiquity, and distinctness from co-territorial languages has made it the primary national symbol. Emergence of the Nation. The plebiscite offered to its colonies by France initiated the steps taken toward independence. The CAR first became a member of the newly established French Community, eventually becoming a fully independent state in 1960. Ethnic Relations. Barthélemy Boganda, the first president, had an ambitious view of French-speaking central Africa, but the government was controlled by riverine ethnic groups until the election of Ange-Félix Patassé, a person of mixed ethnicity from the populous northwest in 1993. 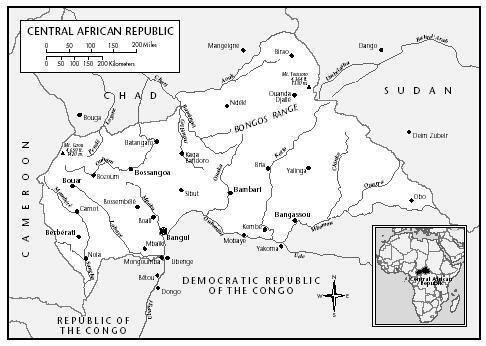 The animosity between the riverine and grassland groups manifested in civil and military strife in 1996 in Bangui, can be traced to the earliest years of the territory. In most cases, however, members of indigenous and foreign ethnic groups get along satisfactorily. Villages, mostly inhabited by the male descendants of a lineage or clan, are located along and face the roads. This practice was introduced in the 1920s, to create "plantation villages" for cotton cultivation. In the 1970s, villages often were consolidated, ostensibly to modernize agriculture. The typical dwelling, which must be replaced frequently because of termites, is made with sundried brick and thatched with wild grass; in the deep forest area palm fronds are tiled on. Mud-and-wattle structures were discouraged under French rule but still exist. Floors are made of pounded earth, on which people sleep on mats with adults sometimes using home-made beds. A whole family lives in a single dwelling, the interior of which is divided, especially when the owners have been influenced by Western culture. Nearby may be a goat pen, but there rarely is a latrine, which are more common in urban centers. Dwellings are used primarily for storage and sleeping. However, in the six-month dry and hot season in the savannah, people frequently sleep outdoors. Family life occurs in open spaces or on a narrow ground-level verandah, and food is prepared at a family hearth situated in the front of the dwelling. The village interior extends up to the road and is kept cleared and swept by women, while the ngonda "bush" (uncultivated land) begins a few yards behind the houses. Village space is therefore completely open, so that one's activities are visible to all and passers by can be seen, greeted, and engaged in conversation. There are no enclosures except among the Muslims and the few people who have adopted their cultural traits. For indigenous Central Africans, concealment and secrecy violate cultural norms. Urban centers are the sites of prefectural (provincial) and subprefectural administration. They are conglomerates of villages, but wealthier people such as civil servants and merchants live in dwellings constructed of cement blocks, laid with a cement floor, and roofed with metal sheets. Larger buildings of that construction type from the colonial period are used by government departments and religious organizations. These secondary centers are connected by a dirt-road system created between 1925 and 1938 with indigenous labor that has facilitated migration and travel, contributing to quasi-urbanization and the nationalization of the culture. Because links between the members of a lineage are maintained, much travel—often as paid passengers on the tops of transport trucks—is associated with illness and death among kin. An extensive network of privately owned bus systems serving the interior has degenerated into "bush-taxi" services. The increase in the population of secondary centers and the agricultural practices of Central Africans have led to disastrous ecological changes, because trees are used for both house construction and firewood, and deforestation around all the urban centers has caused a need for the importation of wood from afar. Bangui is more a huge agglomeration of habitats clustered chaotically around a colonial core than a city. The cost of Bangui's increasing size is the loss of agricultural land on its perimeter. Permanent buildings of cement block and metal roofing are backed by houses adapted to the country with sun-dried brick walls and roofs thatched in grass or palm fronds. These clusters of buildings belong to close kin and resemble precolonial familial villages. Their style is determined in part by ethnicity but largely by wealth; the number of partitioned rooms, by acculturation and number of inhabitants. Few of these houses have electricity, running water, or access to roads. Most people walk to their destinations, but even the poor have been able to afford private buses or taxi-buses while wealthier people have motorbikes or automobiles. Food in Daily Life. The staple is a doughlike mixture of processed and dried detoxified cassava ( gozo ) or sorghum. This is accompanied by a sauce made of vegetables, poultry, meat, or fish. Traditionally, beer was made from sorghum, although locally manufactured beer is now more common along with soft drinks. A hard liquor is made from cassava or sorghum. Chickens and goats in the villages are used as currency in marriages and as gifts and occasionally are sold for cash; wild game, killed in the dry-season grass-burning hunts, supplements the rural diet. At roadside stands, bakery bread and homemade fried bread ( makara ), sandwiches, barbecued meat, and other snacks are sold by women. Restaurants are frequented mostly by expatriates. Coffee and tea, prepared with sugar and canned evaporated milk, are popular in urban centers. 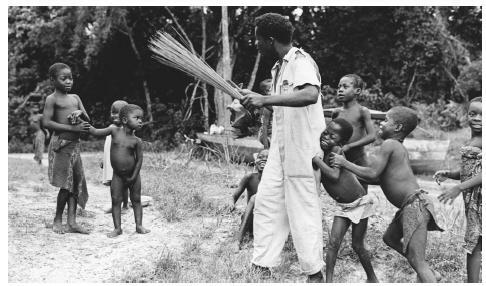 The inhabitants of the forest area subsist on cassava, bananas, plantains, palm-nut-oil, forest caterpillars, and the leaf of a wild plant ( koko ). Individuals, in turn, bring these foods to Bangui to sell at the market. Protein is at a low level in the diet throughout the country. Basic Economy. Central Africans are mostly self-sufficient, growing their own staples (manioc, sorghum, peanuts, sesame, corn, and squash), supplemented by wild tubers, leaves, and mushrooms. Peanut oil is produced commercially. Most products in the stores are imported from other African countries, Europe, and Asia. The most sought-after employment is in government service. In 1989, there were 25,000 persons in government service and only about 4,300 in the private sector, most of them in Bangui. Commercial Activities. Cotton production was obligatory under French rule as early as 1925 and had an irreversible influence on population movements and the politicization of residents. In 1961, 50 percent of one's hours at work were devoted to cotton agriculture, and in 1971, 90 percent of the income from exports was attributed to cotton. Coffee plantations and lumbering are also important. 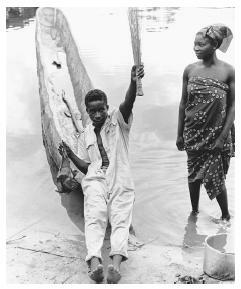 A boatman brings home a bat for soup to the banks of the Ubangi River in his dugout canoe. His wife wears a traditional print wrap dress. is carried on by entrepreneurs. Diamonds and gold are surface-mined mostly by individuals in the Haute-Sangha and Haute-Kotto prefectures; their purchase and sale are dominated by recent Muslim immigrants from nearby countries. The importance of this immigration is reflected in the establishment of diplomatic relations and air service to Cairo and Djedda that provides transportation to those making a pilgrimage to Mecca. Uranium has been found around Bakouma. Trade. Cotton, coffee, and tobacco make up a major proportion of exports, grown by about 80 percent of the population. Classes and Castes. Social class is differentiated by place of residence and work: rural versus urban. In recent years, the imitation of French culture has led people to refer to the "provinces" and to their inhabitants as paysans —"peasants." Power differentiates the bureaucrats from the governed. People with power, economic security, and education are considered intellectuals. These constitute the upper class. The middle class consists of people in commerce and business, most of whom are Muslims. Employees in the public sector support at least a tenth of the population. In 1982, only 52,000 people had regular employment. The vast majority of people are either farmers, self-employed, or are unemployed, including in urban centers the partially educated. Symbols of Social Stratification. Traditionally, people avoided the display of power and wealth because they were shared in the lineage. In spite of the acquisition of wealth and Western goods, egalitarianism continues to be the ideal. Government. The government, patterned after that of France, has a parliament consisting of the National Assembly and an Economic and Regional Council that is led by the president. The president is elected by universal direct suffrage and serves a six-year term. There are ministers with domestic and international portfolios, but the president has personal control of the radio and television systems. The nation is divided into prefectures and subprefectures. At the village level, the government is represented by an appointed "chief" approved by the government whose main role is to represent the villagers and enforce laws such as the annual head tax imposed on males. In urban centers, there are wards and neighborhoods also headed by chiefs. Leadership and Political Officials. Leadership at the highest level has usually come from the military, and sometimes from the civil service. Those holding high office play their roles with formality and a sense of invulnerability. Distance from the mainstream is maintained by the use of the French language. Social Problems and Control. Very little has been done to control forced payments from drivers of cars and trucks at road blockades by young men and the violent highway banditry in the hinterland. Under most regimes, the security forces have not been paid regularly, leading to civil strife. Structures for social control resemble those of France; the gendarmerie (police), like the military, is largely ineffectual in controlling theft, a crime which often takes the form of armed robbery. There are two parrallel systems in the judiciary system, one similar to that in France, and one based on customary law. Military Activity. An army serves to protect the presidency and maintain civil order. A group of children surround a boatman near Bangassou. Men constitute most of the employed workforce. Division of Labor by Gender. Women traditionally are responsible for the production and preparation of food. Women also work in private holdings growing cotton and other products to participate in the money economy. They are the principal vendors of food products in markets. Men contribute heavy work in rural areas and constitute most of the employed workforce. The Relative Status of Women and Men. In politics, the civil service, the military, and the police force, women are well represented despite being less educated. Women are less likely to attend, much less finish, primary school. Marriage. Traditionally, and to some extent in modern-day rural areas, marriages were arranged by the members of a family's lineage. Few could afford polygamous marriages, although polygamy varies both between rural areas and urban centers, and between ethnic groups. The young man is obliged to work for the girl's family for as long as up to four years, after which his family pays a brideprice. With the increased emphasis on acquiring monetary wealth, the brideprice and the accompanying gifts have become onerous or unachievable for many in urban centers. Due to the increased expenses associated with weddings, the number of church weddings among Christians has dropped. Stable common-law marriages are parallelled by liaisons ("relationships") in Africa, in which a woman remains with a man as long as he cares for her. A man can "divorce" his wife by putting her belongings in front of the house and locking the door. Divorce traditionally depends on the return of the brideprice, with added contributions that depend on the number of children. The woman's family can continue exacting payments as long as she bears children, who become members of the man's lineage. Domestic Unit. The basic unit consists of the biological father and mother, their children, and other close kin for varying periods of time. The parents' siblings also take part in the rearing of the children and their resident cousins. Children in rural areas are sent away to serve adult kin, sometimes to receive a formal education in a larger village or town. 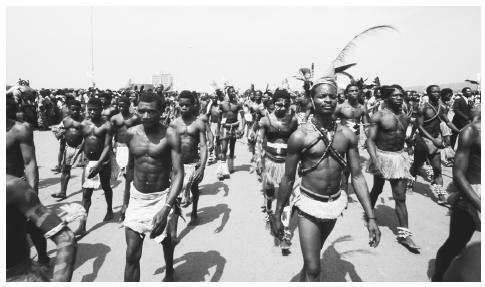 Men march in traditional dress to celebrate the coronation of Emperor Bokassa I.
parents on social behavior, and corporal punishment is never severe. A child's exaggerated screams bring adults to mediate on behalf of the child. Siblings avoid fighting. Child Rearing and Education. A child's most important responsibilities are to respect, obey, and serve adults and to avoid causing trouble (such as theft) with non-kin. Respect for age is encoded in the language. Education follows the French system, and is available to all, although the system is handicapped by insufficient funding. The educational system is frequently disrupted by walkouts by unpaid teachers. Attendance in primary school is around 50 percent but drops progressively in the upper grades. Dependence on foreigners for teachers has been almost eliminated, but the quality of teaching has fallen. Higher Education. With a baccalaureate degree a person may enroll at the University of Bangui to prepare for a career in public service or to emigrate to France. The majority of the students attending higher education are male. People adjust their speech according to the age and role of their interlocutors. Although the second person plural pronoun is used to express deference in speaking to an individual, among young urban dwellers there is an ideology of equality and solidarity that leads to the use of the singular pronoun. Religious Beliefs. The practice of traditional religion has declined since the 1950s in favor of various forms of Christianity. The first missionaries established Saint Paul des Rapides at Bangui in 1894, and Protestant missionaries, mostly American, arrived in the early 1920s. Protestant Central African churches, once aligned with the denominations of the early missions, have splintered into several factions as a result of competition for leadership in the clergy. Charismatic forms of Christianity are practiced in independent churches. There are also syncretistic movements with traits from Catholicism, Protestantism, and Islam. Islam is growing through immigration and conversion; boys sometimes convert to gain employment. Rituals and Holy Places. Traditional religious practices continue in the annual grass-burning hunts of the dry season and in rare initiation rites. More common are ceremonies associated with clitorectomy, although modern-day circumcision has been almost entirely secularized with boys being sent to a local clinic. Expressions of traditional religion in Bangui are rare, but marches and parades, especially among Christian youth and women, are common, with uniforms and banners displaying one's allegiances. Members of syncretistic churches wear special clothing. Death and the Afterlife. Most people believe that death is the consequence of ill will (sorcery). At traditional wakes, kin frequently charge each other with having killed the deceased; all-night dancing and mourning last for several days. There may have been traditional burial grounds, but cemeteries were introduced by Christians and Muslims. In Bangui and other urban centers, burial in cemeteries is obligatory. The only major hospital is in Bangui, but there are mission-operated, private, and governmental clinics. By the 1950s, specialists in traditional medicine began to decline in importance. Belief in sorcery is widespread even among Christians, and protective charms on a person's body may be more common among some Muslims than among other Central Africans. The most common causes of death are AIDS, malaria, and schistosomiasis. Epidemics of meningitis occur frequently. Mother's Day has become a holiday of considerable importance in urban centers, used by women to exact gifts and privileges. The political celebrations are Independence Day and Memorial Day in honor of Barthélemy Boganda, the first president. Literature. The CAR is an oral society and the percentage of literate people in both French and Sango is very low. There have been only intermittent and ephemeral periodicals, mostly in French. A poorly stocked nonreligious bookstore for readers of French exists in Bangui. Performance Arts. Popular dance music, a local version of the style characteristic in Kinshasa, Democatic Republic of Congo, and Brazzaville, Republic of Congo, has been recorded and sold commercially and played on the radio. Cordell, Dennis. Dar al-Kuti: A History of the Slave Trade and State Formation on the Islamic Frontier in Northern Equatorial Africa (Central African Republic and Chad) in the Nineteenth and Early Twentieth Centuries , 1977. ——. Dar al-Kuti and the Last Years of the Trans-Saharan Slave Trade, 1985. Decalo, Samuel. Psychoses of Power: African Personal Dictatorships, 1989. Hewlett, Barry S. Intimate Fathers: The Nature and Context of Aka Pygmy Paternal Infant Care, 1991. Kalck, Pierre. Central African Republic: A Failure in Decolonisation, 1971. ——. Historical Dictionary of the Central African Republic, 1980, 1992. —, compiler. Central African Republic, 1993. Le Vine, Victor T. Political Leadership in Africa: Post-Independence Generational Conflict in Upper Volta, Senegal, Niger, Dahomey, and the Central African Republic, 1967. Mangold, Max. A Central African Pronouncing Gazetteer, 1985. O'Toole, Thomas. The Central African Republic: The Continent's Hidden Heart, 1986. Samarin, W. J. "The Attitudinal and Autobiographic in Gbeya Dog-Names." Journal of African Languages 4: 57–72, 1965. ——. "The Art of Gbeya Insults." International Journal of American Linguistics 35: 323–329, 1969. ——. "French and Sango in the Central African Republic." Anthropological Linguistics 28: 379–397, 1986. ——. "Damned In-Laws and Other Problems." In Mohammad Ali Jazayery and Werner Winter, eds. Languages and Cultures: Studies in Honor of Edgar C. Polomé , 1988. ——. "The Creation and Critique of a Central African Myth." In Revue française d'histoire d'outre-mer (318): 55–81, 1998. ——. "The Status of Sango in Fact and Fiction: On the One-Hundredth Anniversary of its Conception." In J. H. McWhorter, ed., Language Change and Language Contact in Pidgins and Creoles , 2000. ——. "Explaining Shift to Sango in Bangui." In R.Nicolai, Ph. Dalbera, and De Feral, eds. Leçons d'Afrique: Filiations, Ruptures et Reconstitutions des Langues: Un Hommage a` Gabriel Manessy , 2001. Titley, Brian. Dark Age: The Political Odyssey of Emperor Bokassa , 1997. Villien, François. Entre Oubangui et Chari vers 1890, 1981. I THINK THAT THESE WOMEN NEED TO BE EDUCATED MORE IN ORDER TO MAKE THEM MORE AWEAR OF THE IMPORTANT ROLES THEY PLAY IN THIER SOCIETY AND THE WORLD AT LARGE. THEY SHOULD ALSO HAVE EQUAL RIGHTS IN CHOICE OF MARRIAGE AS THE MEN DO AND MOST IMPORTANTLY SHOULD BE EDUCATED ON HOW TO USE COMPUTERS, OTHERWISE CENTRAL AFRICA MAY REMAIN UNDERDEVELOPED FOR A LONG TIME. I found this very informational I am doing a report for school and it helped alot. I would of liked to see more on Health and Government. And also, more pictures. Thank you. This was very helpful to me. I'm trying to build friendships with someone from CAR and it's good to know where they're coming from. I'm really disturbed by the lack of respect toward, and mutilation of, women in this culture. While I'm not proud of all things American (I'm from the States) it's good to know that I can give birth to daughters safely and raise them in a society that allows them to choose their own destiny, and for the most part, respects and protects them simply because they are human. It was quite interesting to stumble across this info on C.A.R. as I was born and raised in the country. I was born in a town north of the capital called Sibut and lived in country till about age 15. I found most of this info to be accurate although much of the more recent changes within the countries social and ecinomical structure is not covered. Either way it is very cool to find info about this secluded and underdeveloped country that I came to know as home! Thank you soo much for all this information! I'm currently doing a school project on central africa and this really helped me a lot. Danke Sehr! This information will be very helpful to me and my group, especially since the internet is a vast drought when it comes to culture. thanks for the info! it helped a lot for my french project on 'la republique centrafricaine"
thank you for the information. this will help me to finish my school project and learned also a lot here. I will be traveling to CAR and I will like to see more of pictures from the the food theyb eat to more of the people on the street or anything that we can see and associate with. Thanks for the ionformation nanyway. Thanks you so much for the information that I got for my Terms papers,but I ask you if there is possibility to add about the Educational system in C.A.R. I am doing research on CAR. Is CAR considered a non - western culture ? need some information about clothes... can you please add it?